My sister and me at the game! The Duquesne men’s basketball game on Saturday against St. Bonaventure was definitely the most exciting Duquesne game I’ve ever attended! Not only was the game thrilling, and the one point victory sealed the deal, but the rowdy Bonnies fans sitting in front of me were a show in themselves. The Dukes got up early in the game, and it looked like the 20 Bonnies fans had driven from Middle of Nowhere, New York for nothing. By halftime, Duquesne was up 15 points and I was excited for the second half! The rowdy Bonnies fans being corrected by security. The halftime show was just as thrilling as the game, and I’m not talking about the elementary school basketball team that took to the court (although they were cute!). Right in front of us, the rowdy group of Bonnies fans had seemingly had enough of the looming defeat, and tried to get in a fight! Thankfully, the fan donning his St. Bonnies brown was escorted out of the arena. That didn’t quiet the rest of his crew down at all! Throughout the entire second half, the embarrassing fans were making their presence known, even if the Bonnies themselves were no match for Duquesne on the court. 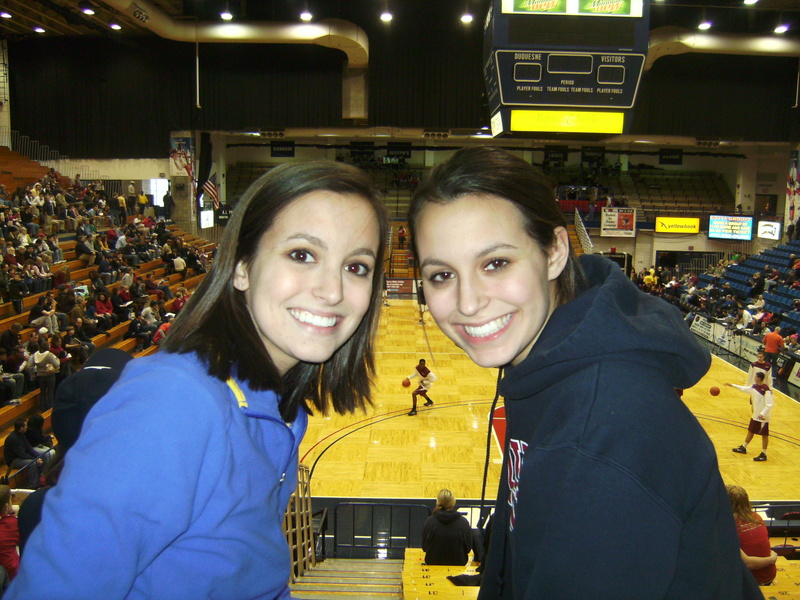 Their behavior made me proud to be a Duquesne fan, and made me root harder for the Dukes in the second half! Despite my growing anger toward the St. Bonaventure fans sitting front and center, the Bonnies drew back within a few points of Duquesne, and the game quickly came down to one possession. 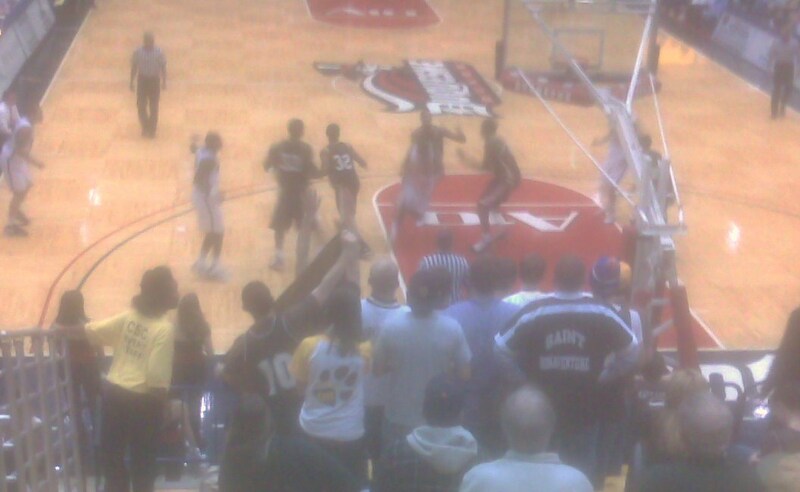 At this point, I was not only rooting for the Dukes but I was rooting just as hard against St. Bonaventure! In one of the most thrilling finishes in a college basketball game that I’ve ever seen, Damian Saunders found Melquan Bolding, who buried a 3-pointer from the right corner with 3.4 seconds left in the game. What a great time to be a Duquesne fan!! To the dismay of the Bonnies fans in front of me, their team couldn’t drain a shot in the final seconds, and the Dukes pulled out the 70-69 victory! Like my Dad and I always say, we don’t like fans of the other team. I hope everyone is getting through their finals while still keeping sane! I took a break from studying this weekend to attend the Dukes basketball game as they took on Robert Morris. Not only was it an awesome game, but the halftime show was quite memorable! 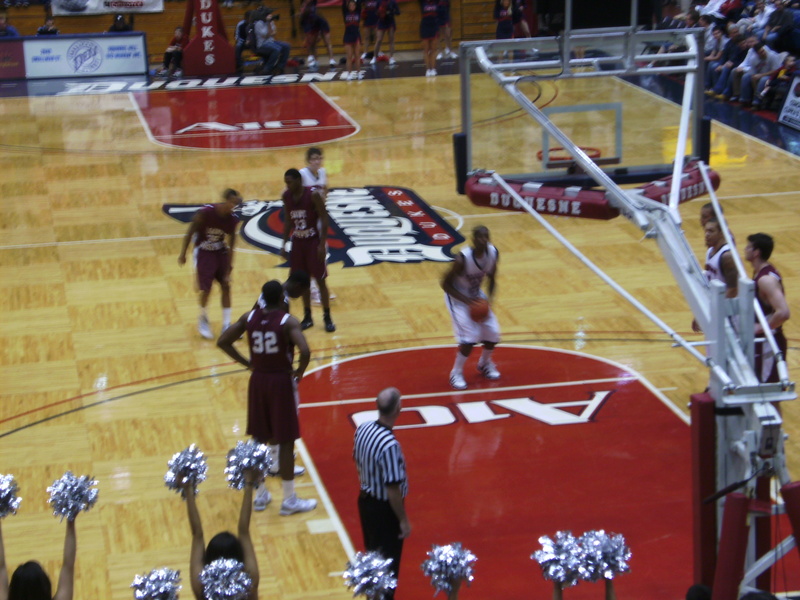 Here are some pictures from the close game, where Duquesne came out on top 59-54. Also, I took some shots of the halftime show with really talented dogs catching frisbees and doing tricks! The Dukes gearing up for the game. 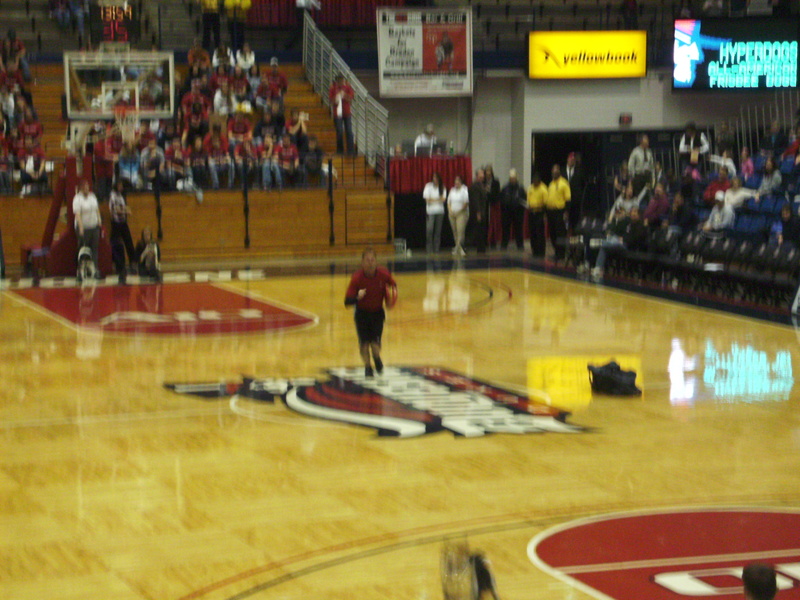 The awesome halftime show with dogs catching frisbees and doing tricks! It has become a running joke in my family that for every holiday or birthday, recipients can expect a Duquesne-themed gift from me. Although I am guilty as charged, I can honestly say it’s not on purpose! It all began the first Christmas I was at college. Without a car or any convenient way to go shopping while living in a dorm, I opted to get my entire family in the Duquesne spirit with Duquesne gifts! 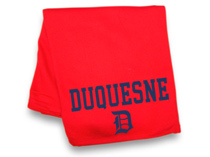 I got my sister a red fleece Duquesne blanket that she had told me she loved. 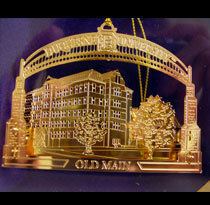 I got my mom a Duquesne hoodie and a Duquesne Christmas ornament with a picture of Old Main on it. I got my Dad a Duquesne Under Armor shirt. They all loved their gifts and I imagine they were happy I was proud of my school. For my dad’s birthday last year, I bought him a Duquesne basketball hoodie because we have become big Dukes fans since the time I’ve attended Duquesne. At some point during my three years here, I also bought him a “Duquesne Dad” t-shirt that he wears proudly! This year for my dad’s birthday, I simply forgot all of the Duquesne attire he had in his closet, and came up with a great, original idea: a Duquesne basketball long sleeve shirt! It took me until he opened it to realize that this wasn’t such an original idea. Now, he had a bunch of shirts to choose from when attending a Dukes game! My sister is just as lucky as my dad in the Duquesne-attire department. She has my old Orientation t-shirt, long sleeve shirts, t-shirts, a hoodie and probably much more that I have forgotten. Oh ya, and that fleece blanket! We have Christmas ornaments, stickers for our cars, key chains and pins. I have turned my Pitt-fan family into proud Duquesne supporters! If you are racking your brain for an origninal Christmas gift idea, while at the same time juggling five books and memorizing vocabulary in time for finals, head down to the bookstore and take a stroll around. 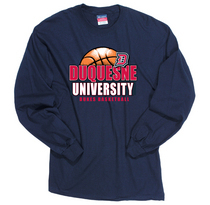 There are always new items and clothes, and every Duquesne family needs their gear! Just be sure not to get your mom the same exact shirt two years in a row! Like Matt, I was look forward to blogging about the City Game all week! Although the Dukes didn’t come out on top, the game was exciting from the tip off until the buzzer at the end of the 2nd OT. My family and I have been Pitt basketball fans for years (my dad went to Pitt), but I was donning my Red and Blue Crew t-shirt tonight, secretely hoping the Dukes could upset their cross-city rivals. Here are some pictures from tonight’s game, the last college basketball game in the Mellon Arena! The Red and Blue Crew came out strong tonight. We easily outnumbered the Oakland Zoo! 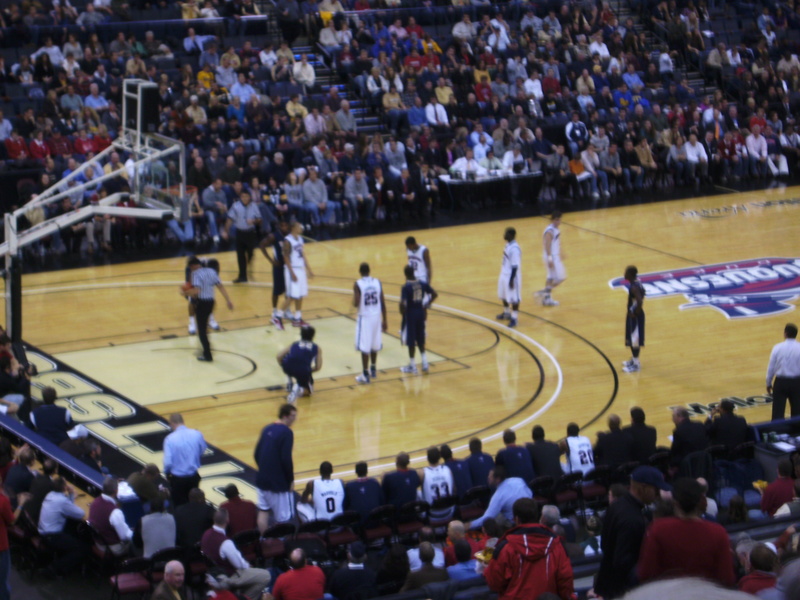 Last night, I got to experience a rare treat: Duquesne basketball on national television. Granted, it was on ESPN U, which is about the 34th rung of ESPN channels, but it was better than what Duquesne usually gets (public access broadcasting). Anyways, Duquesne pulled out a thrilling victory thanks to a game winning three pointer by Bill Clark, a former floormate of mine. It was an absolutely clutch shot, with two defenders smothering him, but he got it to rattle home. 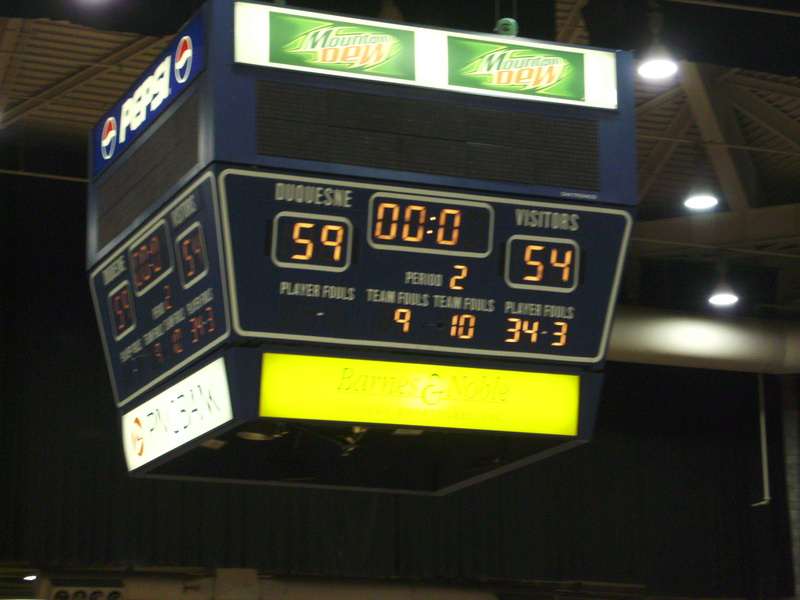 In spite of playing a fairly below average game, Duquesne managed to take the W over Iowa, 52-50. It was a brief break for me during what has been a hectic last few weeks. The plus side is I’m leaving for home Friday and taking two days of classes off to see my family, watch my brother’s play, and go to a cousin’s wedding before Thanksgiving break starts. The negative is that, since I’m leaving early, I have a ton of work to do before I leave. Yeah folks, it’s that time of year–the last month before the end of the semester. I get done finals quite early this year–I’ll be finished everything three weeks from today. That’s great. But being in the economics program means I have two semester-long papers to finish soon, and since all the other economics students are in the same spot I’m in, getting help from my professors has proven difficult since they have the whole department to help. That’s not to mention the four exams and the media production project I have to prepare. Sometimes, getting out early doesn’t always mean you have things easy. Why am I ranting about this? Because in times when you’re surrounded by work and time constraints, and anything less than your best shot isn’t good enough, you need to pull a Bill Clark. You need to rise up and put forth a concerted effort. You can’t let everything collapse around you and just chalk it up to “a bad semester.” You especially can’t do it come your junior year, where failing, withdrawing, or even taking a D or C can set you back a whole semester. Once you reach this point, your professors expect that you’ve figured out this whole “college” thing, even if no one can ever figure college life out. I know this hasn’t been my best semester of college–work, activities, home life, and classwork have all been bearing down on me in a way they never have before. But even when you know you’ve struggled, you need to figure out a way to come out on top, recharge, and come back even stronger the next time, the way Duquesne and BC did Tuesday night. 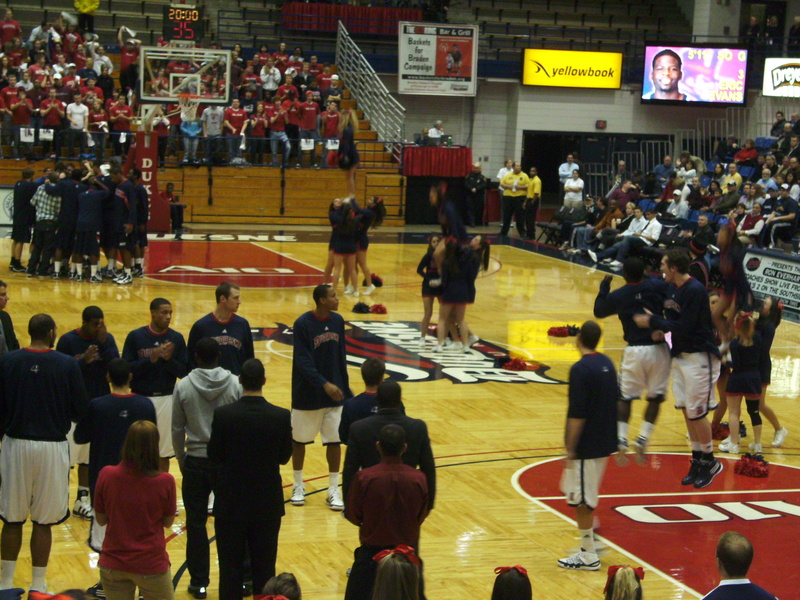 The declaration was drowned out by the G-20 preparations and the cancelled classes, but last week, Duquesne announced that it will be host the first and second rounds of the 2012 Men’s Basketball NCAA Tournament. As a basketball fan, I think this is awesome! I have spent years watching regular season and March Madness games mostly on TV. In a few years, I may get to see a NCAA Tournament game in person, right across the street from campus. Not a bad lookin' arena! The games will be played at the Consol Energy Center. The arena is still under construction, but quickly shaping up to look like an awesome sports arena! I drive past it daily on my way to school and it looks like it’s going to be a great place for Pens fans, and now basketball fans, to enjoy their favorite sport! 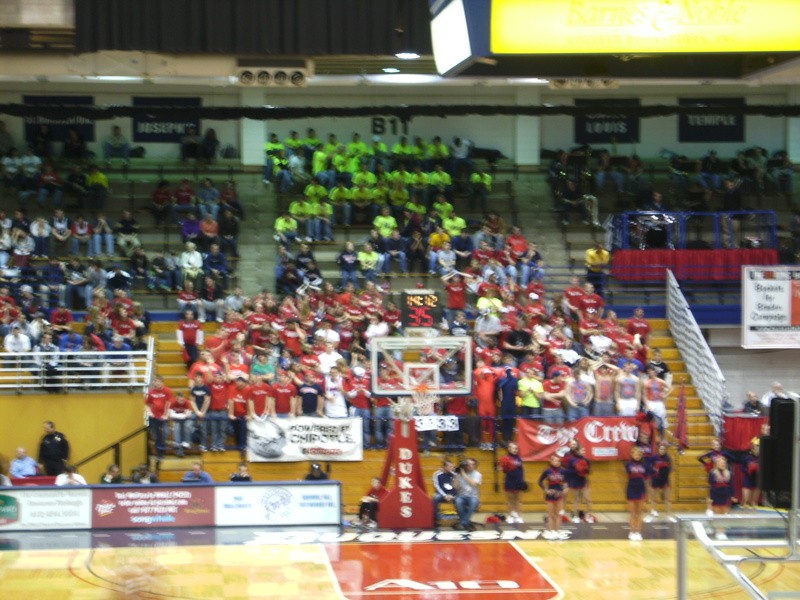 This isn’t the first time Duquesne has hosted stages of the NCAA Tournament. They also played host to the Men’s first and second round in 1997 and 2002, and East Regional women’s Tournament in 2001. (Arguably) like the G-20, this will be a great event for Pittsburgh and Duquesne to host. It will bring in fans from all over the country to spend time in our city and our new Consol Energy Center, and to get to see our beautiful campus firsthand. 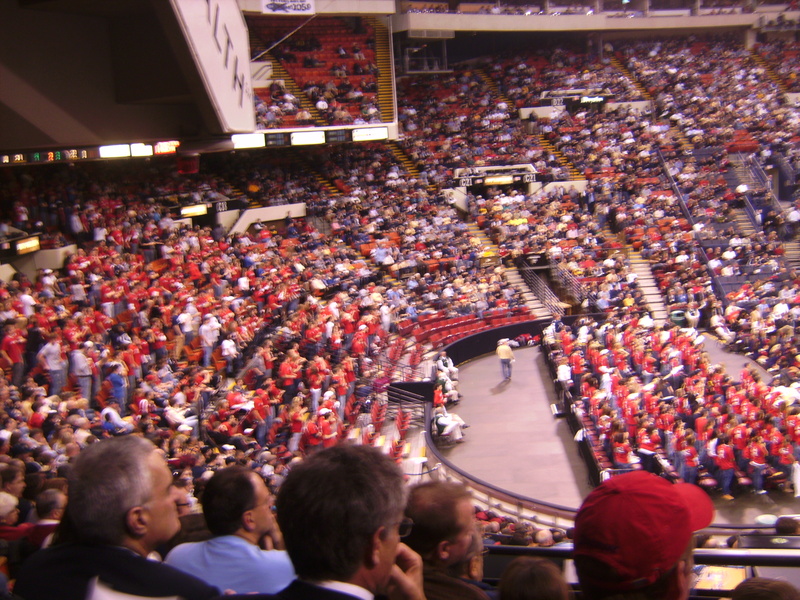 As the host school, Duquesne’s men’s basketball team would not eligible to play at the Consol Energy Center, but other Pittsburgh schools like Pitt and Robert Morris are allowed to play there. This is a great opportunity for Pittsburgh and Duquesne to showcase the new Consol Energy Center to the world through the most important college basketball tournament of the year. It is also a great way for the public to notice Duquesne: a small university hosting a big time event!